Random Tuesday!! Full of artwork and random links and Batman turning in criminals in England. Enjoy the randomosity! 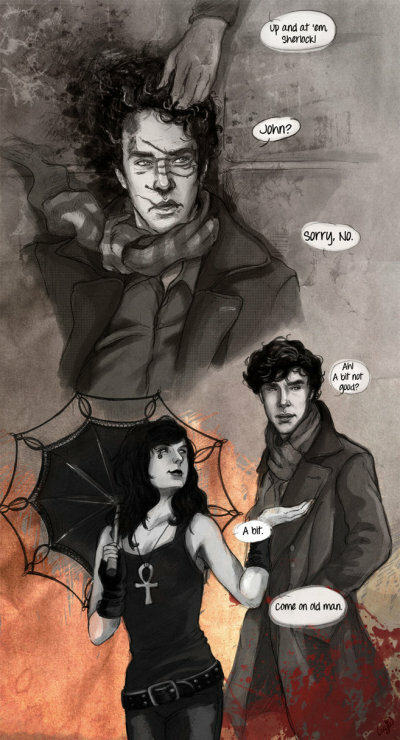 Loobee in the Sky has some cool DeviantArt, including this piece where Sherlock has a run in to Death, who happens to be one of my most favorite of fictional characters. A lot of her art is X-Men and Lord of the Rings cuddle slash, just as a forewarning, but it's really pretty. This article on Tor is really interesting, especially for someone like me who finds pop culture leaking into my vocabulary on a daily basis. Emily Asher-Parrin discusses how we take the awesome things from pop culture and incorporate them into real life. This week's io9 list is 10 novels that are scarier than most horror movies. I don't know if I would call John Dies at the End super scary, but rather super gross and weird. If you're obsessed with television like I am, you might be interested in this collection of plots that might be on your television in the next 12 months. Batman turned in a criminal a few days ago in England. I bet this will be a story around the police station for a very long time. Best. Cosplay. EVER! A guy went to Emerald City Con dressed as the Hawkeye Initiative. If you are unfamiliar with this initiative, clear your calendar and check out this website. Props and costumes from A Game of Thrones are going to be traveling around the world over the next few months. Unfortunately the only US stop is in New York City, but if you can get to one of the stops, this will probably be a pretty cool fannish experience. Any random things I've missed this week? Link'em up in the comments!